This week, the WTO authorized Mexico to impose an annual $163 million in trade sanctions against the U.S. for the dolphin-saving U.S. labeling program for tuna. The WTO ruled against the program in November 2015, calling it a “technical barrier to trade.” If their ruling this summer once again decides against the U.S., the U.S. could face sanctions until the dolphin-saving label is altered or eliminated. Background: Tunas and dolphins can commonly be found together in the Eastern Pacific Ocean. Taking advantage of this, fishing companies have set upon dolphins to catch tuna, often killing and injuring dolphins in the process. In 1990 the United States enacted a ban on imports of tuna caught with dolphin-unsafe practices and created a label for “dolphin-safe” tuna. 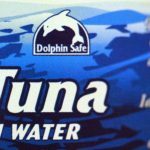 The “dolphin-safe” label contributed to a 97% reduction in dolphin deaths in Pacific waters where dolphin and tuna cohabitate. Nonetheless, the program was gutted after the U.S. lost a Mexican trade challenge against the import ban. Since then, the dolphin-safe label has been a voluntary, not required, label. The WTO has ruled against this voluntary label in 2011, 2012, and 2015, deciding the label violates WTO rules despite the fact that it protects wildlife, is voluntary and applies equally to domestic and foreign firms.